Codman Neurovascular has drawn our attention to registry data, published in the August edition of Neurosurgery, the official journal of the Congress of Neurological Surgeons (CNS) in which 81 percent of patients had 90 percent or higher aneurysm occlusion after 21 months and only 8.3 percent required retreatment after stent-assisted coil embolization with the Enterprise® Vascular Reconstruction Device (VRD) and Delivery System. The 229-patient retrospective registry included data from nine high-volume neurointerventional centres in the United States and Puerto Rico. Thirty-two of the patients had ruptured aneurysms. On average, patients were 57 years old at the time of treatment and had a 9.2 millimeter aneurysm. In addition to the headline stats the registry also found that 90 percent of patients had modified Rankin Scale (mRS) scores of two or less at last follow up, meaning the vast majority were independent and had no significant disabilities almost two years after treatment with the device. The mRS score is a measure of the degree of disability or dependence after stroke. The lower the score, the less disability or dependence. The disease/treatment related mortality rate was zero point five percent (0.5%), and the all-cause mortality rate was 1.5 percent. “These data suggest that physicians are continuing to improve their ability to treat wide-necked cerebral aneurysms. There were less patients requiring retreatment than have been previously seen in other studies and higher rates of progressive occlusion over time,” said J. Mocco, MD, Associate Professor of Neurological Surgery, Radiology and Radiological Sciences, Vanderbilt University Medical Center and a co-author of the paper in Neurosurgery. 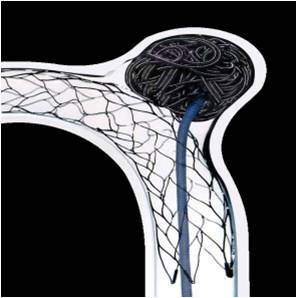 Codman received Humanitarian Device Exemption (HDE) approval for the Codman Enterprise VRD, a self-expanding stent and delivery system, from the U.S. FDA 2007 and CE Mark approval in 2006. HDE approval is granted for Humanitarian Use Devices (HUD) that are intended to benefit patients by treating or diagnosing a disease or condition that affects or is manifested in less than 4,000 individuals in the United States per year and for which no comparable device is available. HDE approval is based on safety and probable benefit; HDEs are exempt from the requirement to provide a reasonable assurance of effectiveness. The Codman Enterprise® Vascular Reconstruction Device and Delivery System is authorised by Federal Law for use under its HDE approval, with embolic coils for the treatment of wide-neck, intracranial, saccular or fusiform aneurysms arising from a parent vessel with a diameter of ≥2.5mm and ≤4mm. Wide-neck is defined as having a neck width ≥4mm or a dome-to-neck ratio <2. The effectiveness of this device for this use has not been demonstrated.